The only certain things in life may be death and taxes, but at least your taxes have some silver linings! Being able to write off (or deduct) things you had to spend money on anyway on in the previous year? Score! Most people already use the “big” deductions, like mortgage interest and direct contributions to charity. 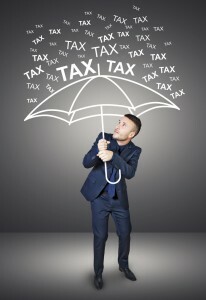 But here are a few more ideas of things you may be able to legally deduct to reduce your income tax bill come spring. Remember to read the tax code carefully and check with your accountant to ensure these rules apply to your situation. 1. State income tax or sales tax. State income taxes that you pay during the year are deductible from your federal income tax. This includes any tax balance from the previous year. For example, in 2014 you can write off taxes deducted from your paycheck in 2013, plus any balance you paid in April 2013 to cover additional taxes owed from 2012. You can also write off sales tax paid to a state, but must choose one (income or sales tax), whichever is larger, and must have receipts if audited to prove the amount you’re claiming. This can only be claimed as an itemized deduction (which you would take if your deductions exceeded the standard deduction). For more info, see IRS Topic 503, Deductible Taxes. 2. Donated items. On top of charitable contributions, you can write off the value of items you donate to a “qualified organization” (think: Goodwill, not your little sister). Remember, this is the current value of the item, not the cost you paid for it originally. The Salvation Army has a donation value guide online to help you. Most items must be donated in good condition, but if valued greater than $500, they can be in any condition. You must keep records of your donations, and any donation over $250 must be acknowledged by the organization. See IRS Publication 526 for more info on charitable contributions; this also must be an itemized deduction. 3. Car mileage for charity. Related to charitable giving, you can also deduct your auto mileage for miles traveled in service of a charitable organization (travel to and from the charity for your volunteer work does not count, only if you drive your vehicle in a specific capacity) at the rate of $0.14/mile. You don’t need acknowledgement from the organization but you do need to have well-kept, timely records. See details in above-mentioned Publication 526. Again an itemized deduction. 4. Dependent care. This covers child care, or the cost of care for a dependent adult (spouse, parent) who legitimately needs paid care during the day and qualifies as your dependent on your tax return. You must be working or looking for work while the care was received (that is, the IRS won’t let you deduct your date night babysitter). You can take this credit even if you don’t itemize, but you can’t double-dip if you are already having money withheld from your paycheck pre-tax for a dependent care account. For information see IRS form 2441. 5. Student loan interest. Even if your parents paid your student loan interest, you can deduct up to $2500, as the IRS views it as your parents gifting you the money to pay the interest. If you’re a parent who paid student loan interest for a child, it’s unfortunately not deductible because the IRS recognizes it was not debt you were actually liable for. You don’t need to itemize. See IRS Tax Topic 456 for more information. 6. Job hunting expenses. You need to itemize to take this deduction, and it doesn’t apply to looking for your first job or a different field, as it must be “in your current occupation.” Also, it only applies if the expenses exceed a threshold (I believe 2% of AGI), but if you spent a long time looking in a year where you didn’t make much money, this might be worthwhile. This includes transportation costs such as mileage, cab fares, plane tickets, and even food and lodging if you stay overnight for an interview, as well as the cost of marketing, business cards, resumes, etc. See IRS publication 529 for info. 7. Continuing education. The IRS offers a Lifetime Learning Credit of 20% on up to $10,000 (lifetime total) spent on education that leads to “new or improved job skills,” even in retirement (thus, the maximum value of the credit is $2,000). Must earn less than $63k individually or $127k jointly to take advantage. See IRS Publication 970 for details. 8. Moving expenses. If you moved more than 50 miles for a job, you can deduct the cost of mileage or flying, moving your belongings, and even moving pets or disconnecting/reconnecting utilities. Mileage, moving your belongings, flying. You must itemize to take this deduction. IRS Publication 521 has the low down. 9. Self-employment taxes. If you are self-employed and pay all of your social security and medicare taxes, you can deduct half (the half that your employer would have paid for you had you been an employee. 10. Uniforms. You can deduct the cost of acquiring and maintaining a uniform for work if the uniform is required by your employer, if it cannot be substituted for everyday clothing, and it is not provided by employer. Again, you must itemize. What overlooked tax deductions do you have to share? To clarify the above, most of the items listed are only if you itemize your deductions and do not take the standard deduction. The standard deduction for your 2013 taxes is $6,100 for single or married filing separately (providing that the other spouse did not itemize), $8.950 for head of household and $12,200 for married filing jointly or qualifying widow(er) with a dependent child. There is an additional bump if you (and/or) your spouse is over 65 and/or blind. The dependent care credit is for children until they reach their 13th birthday. For disabled children or adults there is no age limit. Student loan interest is deducted from your taxable income, it is not a tax credit. The maximum deductible amount is $2500 and phases out above certain income levels. The half of the self-employment tax is also deducted from your taxable income and is not a tax credit. Medical expenses above 10% of your adjusted gross income (7.5% if 65 or older) include medical insurance premiums (not paid for with pre-tax dollars), dental insurance and long term care insurance premiums. Co-pays for doctors, hospitals and prescriptions, transportation to and from medical appointments, special equipment, hearing aids and eyeglasses are also included. Cosmetic procedures are not. Thank you for the clarifications and expanded details, Myke! I didn’t know I could write a lot of these things off! I’m definitely going to use this next year.